As I've said before, I'm not much of a hockey guy. When the NHL lockout happened I was totally prepared for the season not to take place at all. But now they're playing, and the Chicago Blackhawks are becoming a huge story by not losing. They are 21-0-3 at the halfway point of the shortened 48 game campaign. The Boston Bruins are doing quite well themselves, posting an Eastern Conference best 15-3-3 mark through 21 games (they're 1 point behind Montreal, but the 15-5-4 Canadians have played three more times). 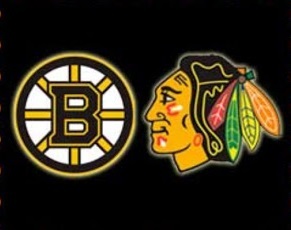 While watching the B's at work last night I thought to myself "wouldn't it be cool if they were the ones to end Chicago's streak?" When I got home I took a look at the schedule to find out when the two teams play each other. They don't. The NHL decided to adopt Major League Baseball's pre-1997 format (when American and National League teams never met until the World Series) for this abbreviated season, eliminating games between the Eastern and Western Conferences. Worried about losing viewers because the lockout, the league did this to create more "rivalry" matchups. Maybe the diehard fans appreciate this, but they weren't going anywhere anyway. People like me with a casual interest are the ones who might stop watching, and I think this is dumb. I don't care about seeing the Bruins vs. Buffalo five times. Variety is a lot more interesting. I'd much rather they played at least one game against Chicago, Detroit, Anaheim, etc. And what about the rivalry Boston's had with Vancouver ever since the Stanley Cup Finals two years ago? I can't imagine there's anybody who'd complain about having the Canucks on the schedule instead of that 4th game with Ottawa.